My name is Chevy and I am AWESOME! I am a one year old Staffie and I get along with everyone. My owner loves me so much but she is moving and I can't go! I am so upset but I am also so very cool that I know I will find a great home and get to know and love a new family! I am a best friend waiting to happen! Congratulations on one year in Fremont Petapoluza! They have everything you could want. The best quality food, treats and gear. Both for cats and dogs. They also have a dog wash station. Just the perfect thing to get your pup ready to go out on the town. When I arrived at Petapoluza to set up for the event, I was delighted to see COLA there. Citizens for Off-Leash Areas. Theo is getting a big hug from his Mom, COLA volunteer. We were glad to be able to donate. Like SODA, they maintain the parks we enjoy with our dogs. Both of these organizations can always use volunteers as well as monetary donations. 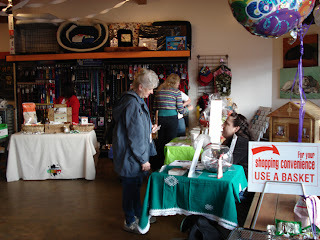 The Seattle Humane Society was there representing their pups that need fosters and adoption. We also had Ginger's Pet Rescue. Ginger specializes in Death Row dogs. She has the biggest heart and the biggest need for fosters. Please contact her if you are interested in fostering, transporting, donations, dog walking or training. 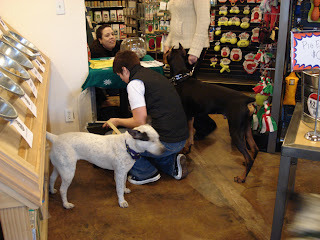 From the minute I set up, there were great clients and fun pups to meet! 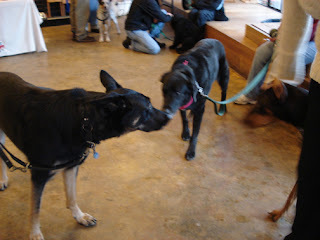 Everyone who came in was so cute, well behaved and a whole lot of fun to take pictures of. Look at Frank and Clara kissing hello. One of many stars of Petapoluza. I have listed our rescues first so you may have your hearts stolen and make that call to adopt! 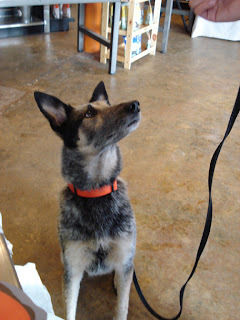 Meet Keeva, she is a cattle dog who is currently in foster and needs to find a permanent home. Foster Mom loves Keeva and Keeva loves everyone! She is smart beautiful and a real good girl!! She played so well with others and did even better just hanging around. As you can see, she's enjoying all the action. Frankie is a reject Cattle dog (so says his foster Mom.) He is so cute, fun and what a great personality! I got along great with him but perhaps he has issues with other dogs. 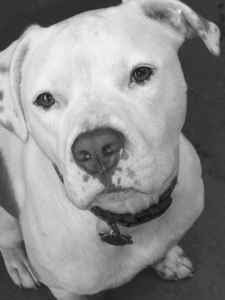 His temperment would work well for a single owner or couple who do not have another dog and want to be one dog owners. These guys are loyal, smart and can learn anything you want to teach them! Frankie stole my heart! How about you... I mean really, just look at that smile. 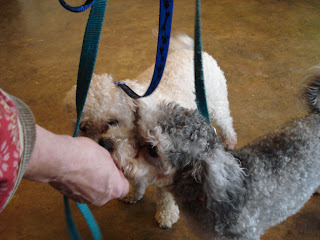 Corky and Sadie are Bischon Poodle mixes who are a pair if I ever saw. They don't seem to like other dogs too much but they sure love each other, people and of course Uneek Treats! They are available through Furbaby rescue. They will only go as a pair. Nikko is just getting started in life. Can you believe he is only 10 weeks! What are they in store for!!! He is the most gentle bundle of fur I have had the pleasure to pet. What a sweet heart. Check out Kong. A Doberman to beat all. What a beauty! Kong has a great time hanging out and saying hi to everyone. She knew what she wanted so after hello's her and Mom got right to it. Clara is a lab that could not be happier to be at Petapoluza! Check out Clara saying hey! 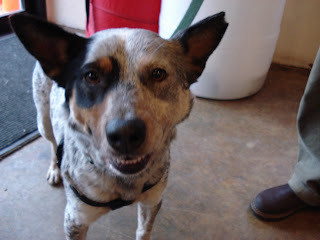 Cody is a Cattle Dog mix. Cody loves Uneek Treats. Cody was so darling and just look at that face! What great ears. All the better to hear you say, "Want a Uneek Treat Cody?" Schnitzel is a Bull Mastiff. Soft, sweet and just look at those jowls! How patient she was when Mom was buying all her favorite things! I got kisses and love. Aaahh! 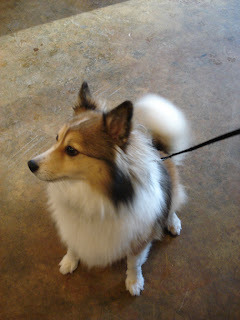 Kylie a Sheltie and American Eskimo mix bounded into the store like she owned the place. Full of energy and all that grace that you will only find in such a refined girl. I would really like to thank Petapoluza for inviting us to come and meet their clients, share our story and treats and just have a great time! Here is to many many more years of providing Fremont with your one stop pet shop! Where you will find everything good! Seahawks Win The Playoffs And Help Pets! What a team we have here in Seattle. SATURDAY, JANUARY 5 BELLEVUE, WA (January 2, 2008) – Saturday morning, January 5, at the Seattle Seahawks playoff game, the Seattle Humane Society will collect much-needed pet food for their Pet Food Bank. With the needs so great in Washington’s flooded areas, local food banks, including the Seattle Humane Society’s Pet Food Bank, are suffering. Right now, the Pet Food Bank supplies are down 40 percent from this time last year. The need for pet food is critical; the Pet Food Bank feeds more than 1,000 pets of low-income community members, senior citizens, and people with HIV. Game-goers are asked to bring any dog and cat food. There are no restrictions, but the greatest need is for dry cat food. All kinds and types of pet food are appreciated. It will be easy to find the collection barrels. They’ll be right next to the Seattle Humane Society’s new MaxMobile, a bright yellow mobile adoption center parked along Occidental Avenue at the northwest corner of Qwest Field starting at 10:30 a.m. The MaxMobile will be traveling to the game with loving animals who need homes of their own. “What better way to start off 2008 than to bring a pet food donation to ‘Max’ and his friends on your way to this Saturday’s Seahawks game,” says Brenda Barnette, CEO of the Seattle Humane Society. “Your donations will help people in need keep their pets well fed and healthy this year.” For those not going to the game, donations are accepted year-round at the Seattle Humane Society shelter, located in Bellevue at 13212 SE Eastgate Way. 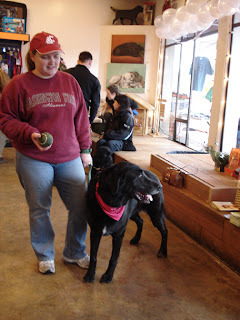 For more information on the Seattle Humane Society’s Pet Food Bank, call (425) 649-7567 or visit www.seattlehumane.org . The Seattle Humane Society has been protecting people and pets since 1897. 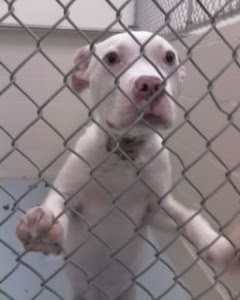 Visit in person at 13212 SE Eastgate Way in Bellevue, or online at www.seattlehumane.org to learn more. Animals First Foundation is Calvins Savior! Now He Needs A Permanent Home! Animals First Foundation was very concerned about the lack of time we had to work with for this little dog. Last night I was able to find a foster and someone contacted me for possible adoption. Early this morning our wonderful volunteers picked up this little one (now named Calvin) and he is being checked out at the vet’s office today. We will do our best to find him a great home. He loves people and is just a darling boy - very eager to please and love. A special note about this situation that we will start posting on “rescue groups only” situations. Someone posted Calvin on Craigslist which is not allowed by the Everett Shelter (because he was not available for public adoption) and by Animals First Foundation. We do not want to tarnish our working relationship with any shelter by not following the rules. So please, we know it was done with good intentions, but do NOT post ANY of our shelter rescues on Craigslist. We will start noting that on our circulations. We do not want to stop being asked to help because of lack of cooperation as we do not have any control over who gets our e-mails. Thank you for your understanding. We are grateful to those that contacted me to find out how they could help. We are very fortunate to have a very active and concerned group. Mission accomplishedJ! Carmon from Grant County Animal Outreach has been attempting to place Big Dog, a 2 year old American Staffordshire Terrier Mix. With the banning of bulling breeds and the phobia associated with them, she hasn't had any luck. This big boy is great with other dogs and excellent with children (please see below). He will be receiving 1 week of professional training this month as well. He is neutered, microchipped and up to date on all shots, including rabies. If you would like additional information, or can provide a devoted foster or permanent home, please contact Carmon at 509-771-2196. Thanks everyone!!! Yesterday, I received a call from the Manager of one of the vet clinics we work with. She offered to foster Daisy!! So, this little girl will be taken on by Animals First Foundation and will be going to work with her foster mom at the clinic. She will receive a full medical exam and we will do our best to ensure a speedy recovery. Thank you for your concerns. 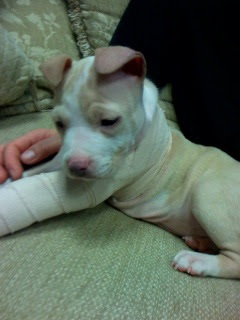 Daisy is a 4 week old Pit Bull puppy who was abandoned. I think she was tossed out of a car. JERKS!!!!! 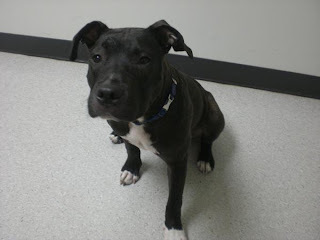 She was brought in to the VCA veterinary specialty hospital in Lynnwood with a broken front leg. 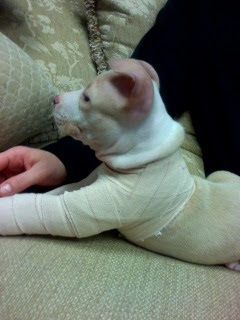 The leg is now in a tiny cast and she was given her first shots. If you are interested in fostering or adopting this cute little girl, please e-mail Jeff at jeffr@radgametools.com or call him at 425-753-2269. 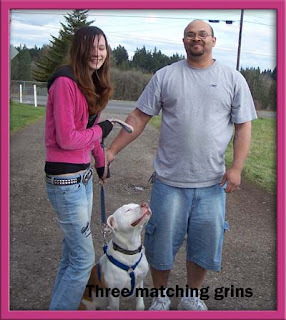 Thank you Carina~Animals First Foundation for your never ending efforts with our toughest cases and most misunderstood breeds! You are an inspiration!!! To See Me Is To LOVE Me and Want Me! Elvis, saved by mere hours, out of a crowded shelter – but no place to go. Loving foster hands took him in until the right home was found. How good is this? Elvis, live long baby! Thank you Kar for your tireless efforts to save every dog you see! You are truly amazing! Elvis is a 2.5 yr old Boxer/Pitt mix. Male, neutered. Medium size. House trained. Indoor/outdoor (usually only outside on nice days and during play). Knows basic commands (come, sit, stay, lay down, off). Loves to fetch, swim, run, go in car, hike, camp etc. He has a ton of energy and still acts like a puppy. Loves people; a true best friend and a real sweetheart. 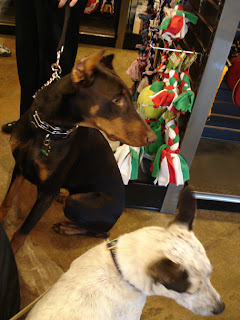 Can be introduced to other dogs; should always be supervised due to insure that there is good behavior all around. OK with cats. Needs responsible, loving owner with secure yard (he can jump very high so a 5-6ft fence is necessary. He wants to be everywhere you are but will wait patiently at home when he can't be with you. We have two dogs, but work keeps us too busy to be able to provide enough attention for both. He needs a new home so he can be given the love and attention he deserves. Free to good home. We can bring him to you. We will want to confirm safe living situation to ensure he'll be in good hands.